"You're a resident of the fair-sized settlement of Gantnok with crippling defenses, constantly being assaulted by Zerg. Gulnier, a wealthy nearby town, has a surplus of a special resource called mynanium which would mean salvation for your town, but they're greedy and ask a price so high that your people cannot pay it. 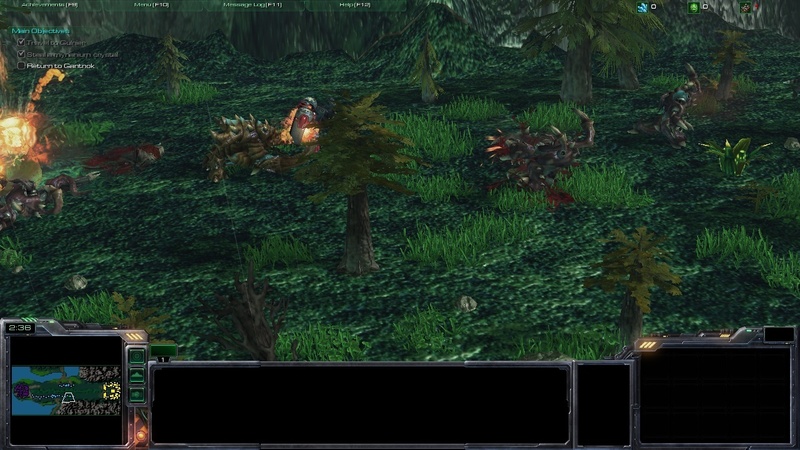 You dash from the safety of your town out into the wilderness, battling Zerg along your path to Gulnier. When you arrive, the settlement trains its weapons on the Zerg following you, so you get a short break. You enter the town peacefully, yet the path you've already cleared of Zerg is obstructed (perhaps a bridge collapsed or far more Zerg were attracted to the noise), so you must use another path which may be even more perilous. The wealthy people of the town are not very happy as you run off with the precious resources that afford them many luxuries, so they send a kill squad to hunt you down as you race back to save your home. As you arrive, the kill squad is consumed by the Zerg, which are then obliterated by a weapon empowered by the mynanium you stole." Published on NA, but I recommend playing it from the editor.